We are still in Italy with this dessert and it’s one of my favorite, I love anything creamy with vanilla but still light. Zabaglione or Zabaione, either way, is a dolce al cucchiaio, meaning a “spoon dessert” or a dessert to eat with a spoon in the same category as pudding, creams, etc… Its origin goes back to 1500 and there are many disagreements in regards to where it has originated, Emilia? Turin? Venice? no one is really sure about it. But one sure thing is that it’s an ancient dessert. You can eat it as an accompaniment with fruits, a slice of panettone, lady fingers or as is. Its a very light and fluffly cream made with yolks, sugar and marsala or dry dessert wines. If you only have sweet marsala, you need to add less sugar to the yolks. This one has been enhanced with caramelized pears and vanilla, and I think I put a little too much vanilla powder on top! I can’t get enough of vanilla! It’s a very simple dessert to make, the little trick is to not let the water and the cream boil, or the cream will become thick and will curdle. Start caramelizing the pears. Melt butter in a pan, then add pear slices, sprinkle with sugar and let the pear caramelize. remove and divide in 4 small cups. Bring a small pot of water to a boil, then reduce the heat so that the water is just lightly simmering, but not boiling. In a mixing container, beat yolks and sugar until they double volume and whitens. Add Marsala gradually and keep on beating the mixture, then place container on top of the hot water, and keep on beating for another 15 minutes until the cream thickens and become fluffy like a mousse. Remove from heat and spoon on top of the pears. Sprinkle with vanilla powder and walnuts. You can either serve it immediately and lukewarm, or place in the refrigerator and serve cold. This entry was posted by silvia on December 2, 2009 at 11:03 pm, and is filed under Desserts. Follow any responses to this post through RSS 2.0.You can leave a response or trackback from your own site. Beautiful. One of the easiest desserts to make. Thanks Silvia for the twist. I agree – too much vanilla is not possible. It looks beautiful and the caramelized pears are a nice touch. mmmh. wow. this looks INCREDIBLE! I want one!!!!! I can imagine the lusciousness of this sweet. This is very interesting and delicious looking. We are on the same wavelength, as I have been reading all about medieval food and plan to do a whole series of old, old recipes. Isn’t that weird? Your zabaglione looks so light and fluffy. 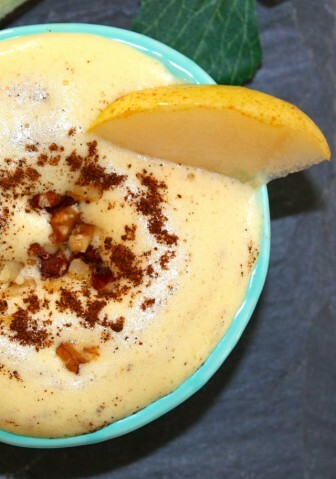 The addition of pears is a great idea, especially for dessert on a chilly evening. 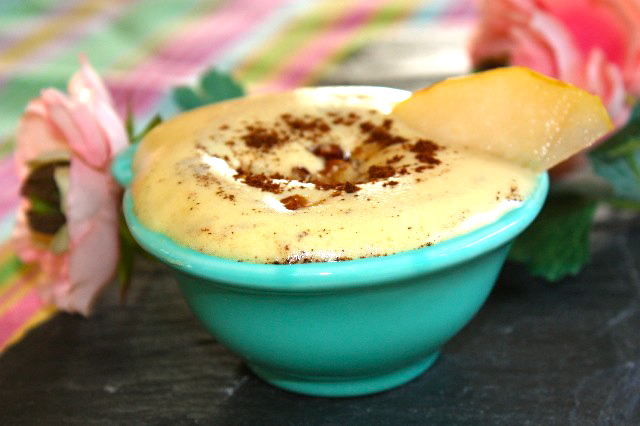 The lightness of zabaglione is so pleasing and I love that you flavored it with caramelized pears. Your photo is so beautiful! So easy but so rich and beautiful. Another idea for me….. YAY! Truly heavenly — the first time I had a zabaglione, I thought I was eating a cloud, it was so light and wonderful. With caramelized pears, it’s heavenly to the tenth power! !